Small details that have little impact on one aspect of your business may end up playing a major role in how another decision is made. 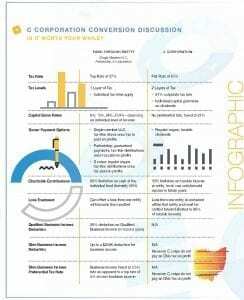 Read this article to learn more if a c corp conversion is right for you. Should You Switch To A C Corporation Under The New Tax Law? This is the second article in a special series that considers the due diligence necessary for business owners who are considering a major change. To view other articles in this series, visit www.reacpa.com/due-diligence-series. Check out this helpful infographic to help you make up your mind. One of the most widely discussed aspects of the Tax Cuts and Jobs Act (TCJA) has been the reduction in the corporate tax rate from a top rate of 35 percent to a flat rate of 21 percent. 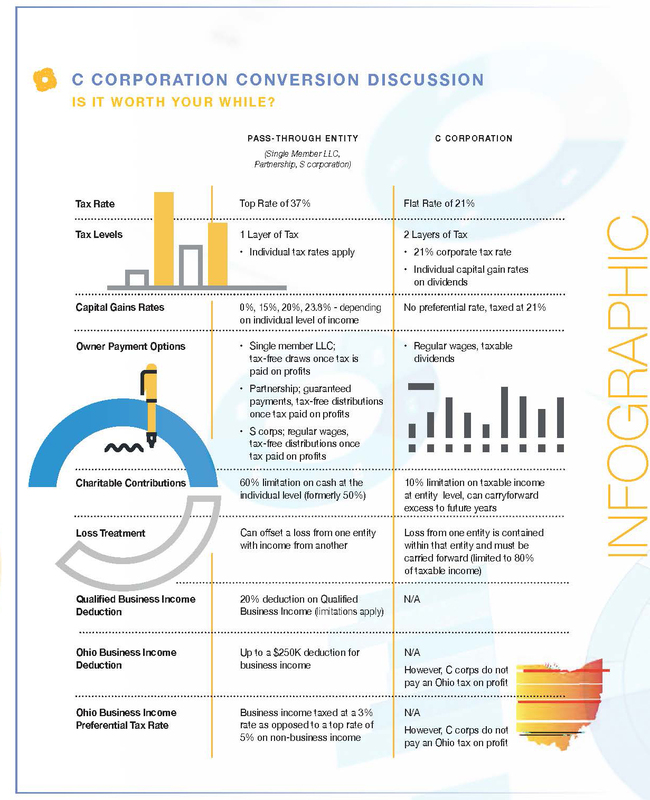 This change prompted many business leaders to consider whether switching from a pass-through entity to a C corporation is the way to go, or if the benefits of the new qualified business income deduction for pass-through entities would make up the difference. While the tax rate reduction does present potential tax savings for the business and its owner, making the switch could have long-term implications. Many have concluded that it may make sense to forego the short-term tax savings to better align with long-term objectives. Perhaps the biggest takeaway when considering an entity conversion is that all business situations are unique, and this decision should be thoroughly evaluated before moving forward in any direction. Small details that have little impact on one aspect of your decision may end up playing a major role in how another decision is made. Unfortunately, digging into these details can be costly and time-consuming. We’ve identified four questions you should ask before deciding whether a shift in entity type makes sense. Still Wondering If Changing Your Business Entity Is A Good Move? Listen to episode 119, “Tax Cuts and Jobs Act: Implications For C Corps & Flow-Through Entities,” on unsuitable on Rea Radio to hear Christopher Axene break down this portion of the TCJA. Since tax is paid on profit, if you have little or no profit to pay tax on, the potential savings a change in entity could generate would probably not outweigh the time, effort and cost to actually make the change. The more profit there is to tax, the more potential there is for a reduction in tax paid. If your balance sheet is “above water,” it’s reflecting more assets than liabilities. If it’s “under water,” it’s showing more liabilities than assets. When considering a change of entity, your balance sheet should be above water. Depending on your business’s existing entity type, conducting a change of entity with an underwater balance sheet could trigger a taxable event, going against your goal to minimize your tax burden. Does A Substantial Amount Of Profit Generated By Your Business Stay In Your Business? Historically, C corps weren’t a preferred entity of choice for small businesses because of the double taxation on profits distributed to the owner. What may be forgotten, however, is that the second layer of tax isn’t actually imposed until the profit is distributed from your business to you (the owner) as dividends. If the profit never leaves the business, the second layer of tax is never incurred. There are a number of reasons you may choose not to distribute profits to yourself, but two of the most common are high rates of capital reinvestment into the business and the repayment of debt. Both of which are usually undertaken to support growth within the business. If this sounds like your scenario, the new lower tax rate at the corporate level may generate substantial tax savings on the amount of profit being used for these purposes. On the flipside, if your tendency is to distribute large portions of business-generated profit, switching to a C corp may not be for you. Any distribution of profit as a C corp dividend would be subject to that second layer of tax at the individual level, possibly eliminating any benefit generated by the lower corporate rate. Do You Plan To Retain Long-Term Ownership Of Your Company? If you’re planning to sell your business in the next few years, it’s better to operate as a pass-through entity rather than a C corp, especially when company assets are involved. This isn’t as critical if the transaction is structured as a sale of corporate stock, but such a transaction usually isn’t as lucrative when compared to purchasing a company’s assets, which would include goodwill. Once you’ve transitioned, you must retain C corp status for at least five years. Additionally, the IRS imposes an additional five-year waiting period to avoid a business-level tax on the sale of assets if a change is made back to a pass-through entity from a C corp. This means that if you were to sell your business’s assets during the 10 years after you elect to become a C corp (at a minimum), you would be taxed on all of the gains. This includes any depreciation recapture, at the business level first and then again when the proceeds are distributed from the company to you as a dividend. Being subjected to two layers of tax would be much less advantageous when compared to the single layer of tax you would pay on the same transaction if your business was a pass-through entity the entire time. These questions are just the tip of the iceberg. If you need help determining your business’s best course of action, contact Rea & Associates for more information.